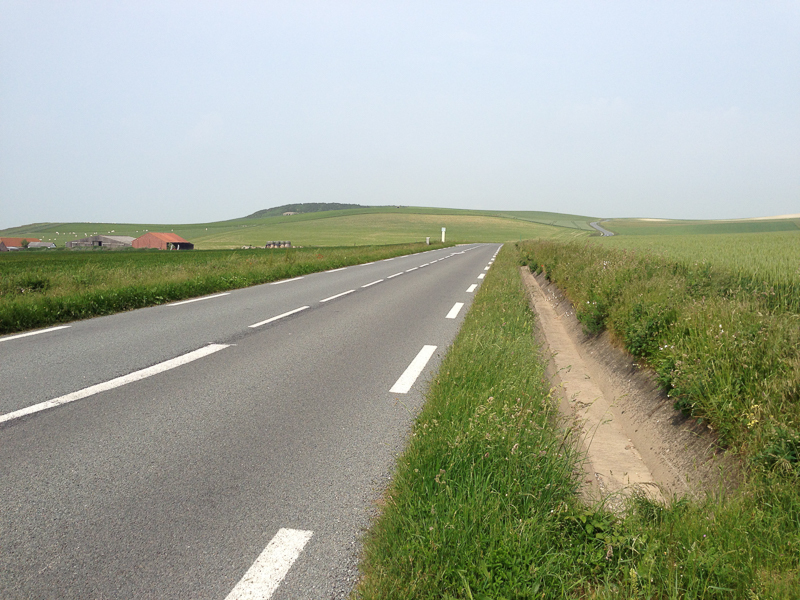 After lunch, we decided to backtrack a little so we could go to the Cap Gris Nez (the Grey Cliffs). 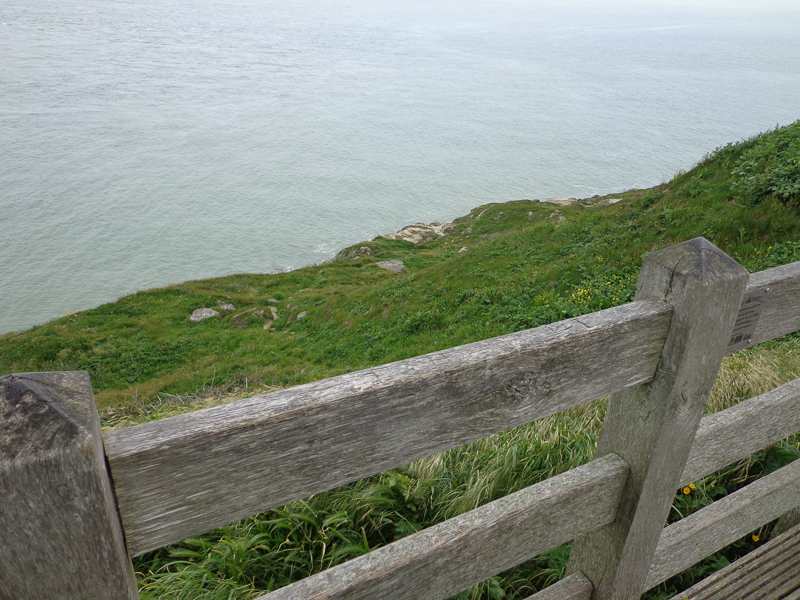 We went up to the top of the cliffs first, and then down to the sea. The top of the bluffs was worthwhile, even though we couldn’t see the grey cliffs because we were standing right on top of them. 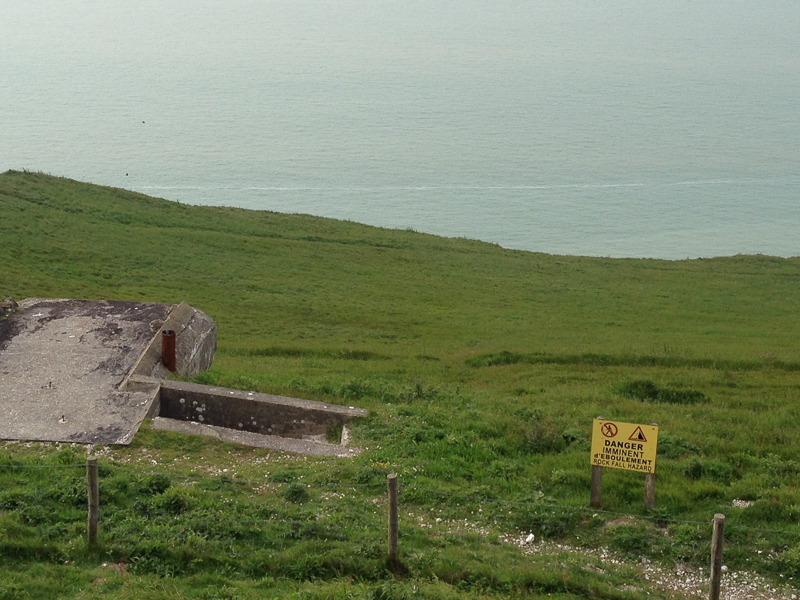 Going down to the sea was…well, pointless. There wasn’t a beach at all, just a concrete boat launch. 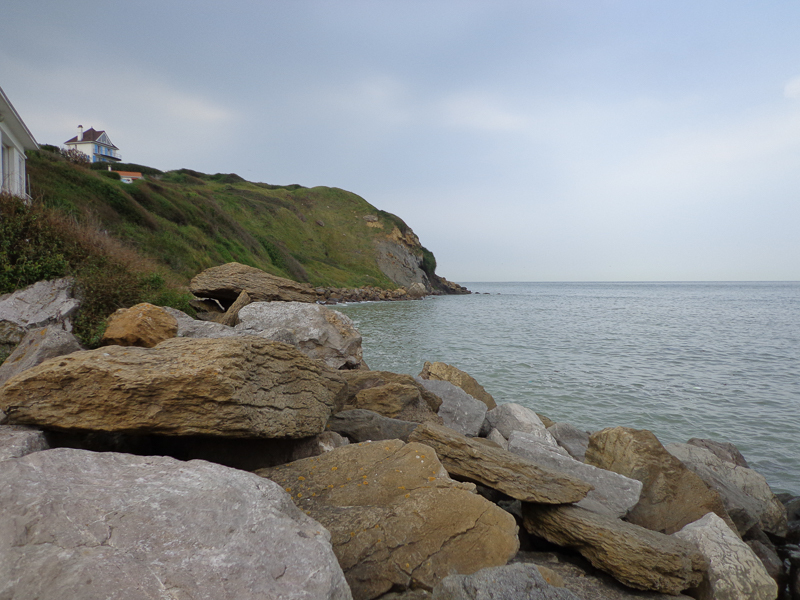 And the angle was all wrong, so we couldn’t see the grey cliffs from that location, either. No matter. An oblique view of the cliffs. It’s hard to tell, but they really are grey. We turned around and began the steep 3 or 4 kilometers back to the main road when Snap! 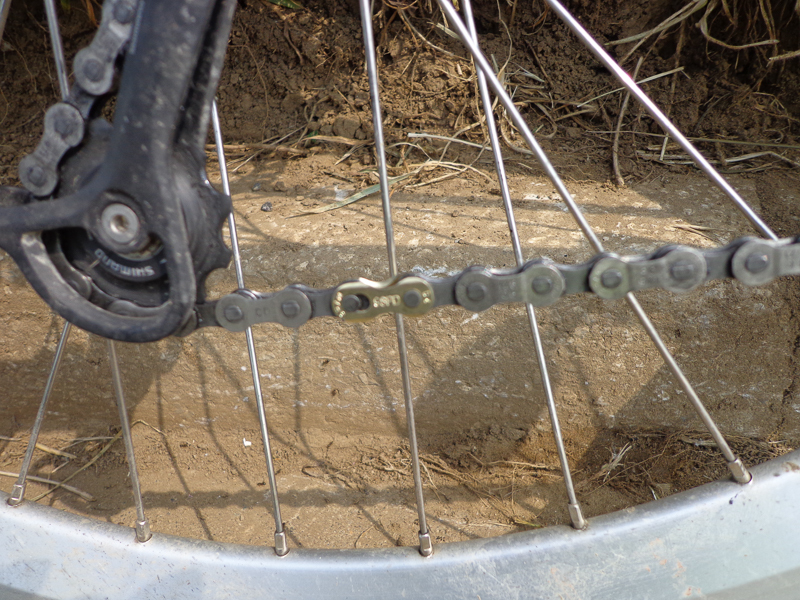 Mark’s bicycle chain broke! Using teamwork, we were able to fix it with very little drama: we had a spare chain link, and our chain tool worked as advertised! By now it was around 3:00 or 3:30, and we estimated we were still 15 to 20 kilometers away from our preselected campsite. We could have taken a right turn to follow the EuroVelo route, because signs for it suddenly reappeared two blocks after our lunch location, but given Mark’s compromised chain, we opted to stay on the main road. So, we rode and rode, climbing up some long, steep hills (with switchbacks, even!) and then flying down the other side and only to climb up yet another hill. We were both so excited to be physically able to make it up the hills. This ride would have killed us a few weeks ago. Today, we were working hard, to be sure, but it wasn’t a gargantuan effort to make the pedals turn! The weather was cooling down considerably as the afternoon progressed, and the sun from the morning became a partly or mostly cloudy kind of day rather than the weak but full sun we had so enjoyed in the morning. 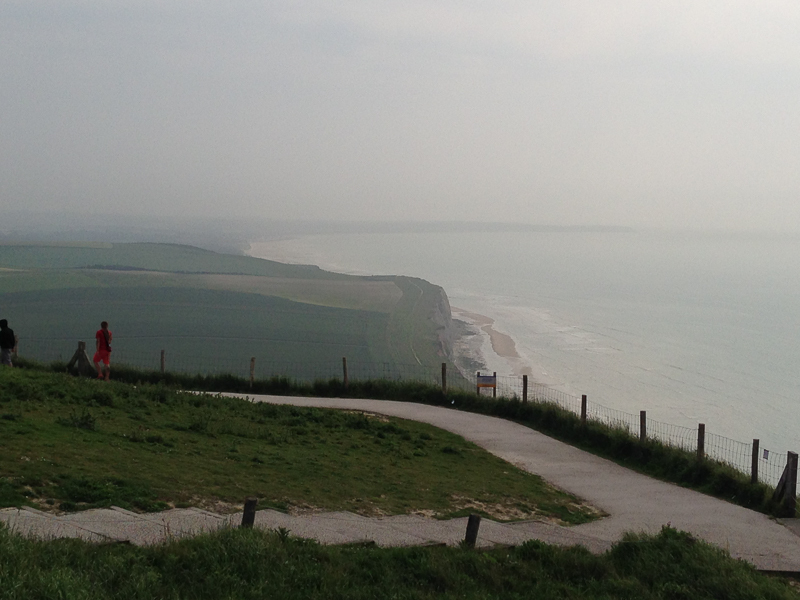 Shortly before Sangatte, our final destination for the day, we arrived at the White Cliffs: Cap Blanc Nez. It was early evening by now, and we were quite tired, so even though the edge of the cliffs was only a kilometer away at most, we debated whether to go to the cliffs’ edge or to continue “home.” We decided that since we’d ridden all that way, we should at least go check it out. Who knows if we’ll ever be here again? Mark enjoyed the WWII history there while I appreciated the beauty of the area, despite everything being shrouded in a seaside haze. 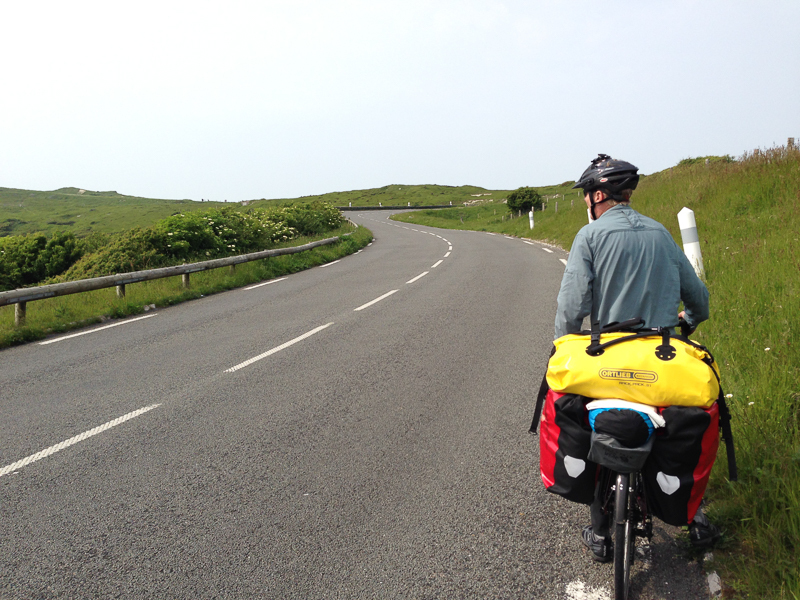 By the time we finished seeing Cap Blanc Nez (well, standing on top of them), we both agreed that we wanted to make a beeline for the campground. We careened down the hill from the top of the cliffs, and nearly coasted the remaining 3 or 4 kilometers to our home for the night, a campground in Sangatte. Setting up camp on dry grass for once!!! Overall, this has been the best day yet: a delicious plat du jour, sunshine, no muddy single track, no getting hopelessly lost, yet taking interesting detours when something captured our fancy. And best of all, it didn’t rain on us all day! We stayed warm and dry (except for hard-earned sweat). 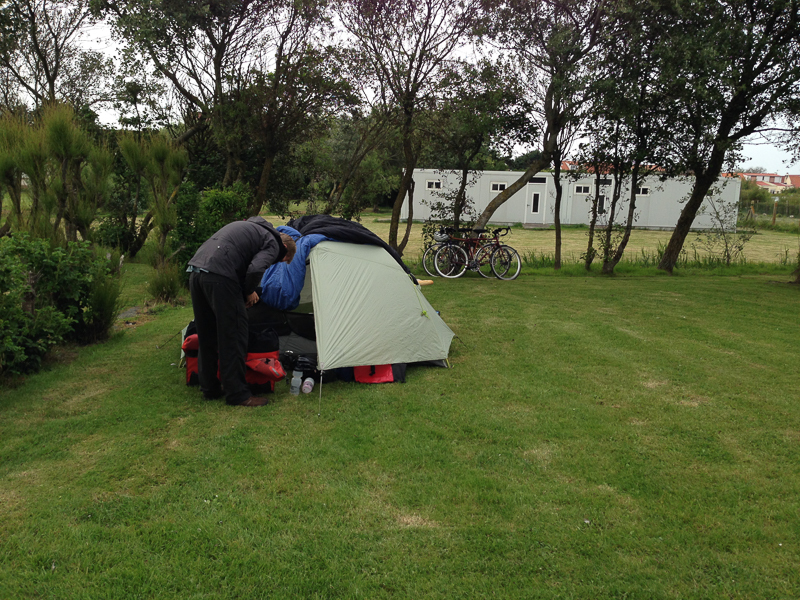 Even setting up camp was a joy: our pitch was on dry grass, not mud or swamp! Last but not least, we both rode strong! 52 km (32 miles) and 702 m (2303 feet) of climbing over the course of the day. That’s a real accomplishment for Team Lumaca! Way to go, Julie and Mark! We’re wishing you more sunshine – and tailwinds! Yay! And you are definitely not posers! What a joyful, fun filled day. So glad you had the sunshine!